Images are very helpful in supporting your website content and making your site interesting to visitors. Images can also be a great tool for SEO, but only when they are used correctly. 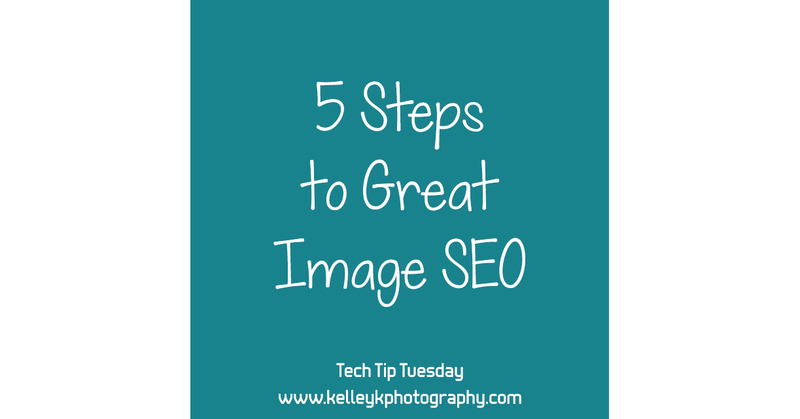 Below are five important considerations when adding images to your web site and blog posts. I actually learned a few things myself in researching for this and will be using some of the tips below to step up my own image SEO game! This is the second part of my SEO series. In the first post of my SEO series, I explain how to identify keywords that you want to use in your web site content. You will use those keywords when adding images to your site, so make sure you’ve identified your keywords first. But remember, as I discussed in the previous post, you should always work your keywords naturally into your content (and your image SEO strategy) so that your web site doesn’t come off looking spammy or unreadable. One of the ways search engines like Google can identify your images is by their file name. It’s much more effective if your page has an image with a descriptive name rather than something like DSC_8473. This means you should rename your photo to a description using 3-5 words, separated by hyphens. Include at least one targeted keyword for your post. I also like to include the name and location of my business in each image title for my web site, although this isn’t as much for SEO as it is for identifying the photo as my own. For example, the image below is titled spring-portrait-girls-laughing-KelleyKPhotography-SmyrnaGA.jpg. The file name is primarily for Google, but it is visible to web site visitors if they look at your web page’s source code, or if they right-click and save the image or open the image in a new tab (if you allow that on your site). Your file name is something that you should set when initially saving/exporting the image for the web, or at least before uploading to your web site. We had lots of laughs at this spring photo session! The other important method that Google and other search engines can identify what is in your photo is by using the alt tag, also referred to as the alt text or alt attribute. The main purpose of the alt attribute on an image is to visible in text-based browsers or read out loud by screen readers and other accessibility tools for the visually impaired. This tag should provide a clear description of the image and should be written without hyphens as you would normally write text. It should not just be a list of keywords, but should be an accurate representation of the image in natural language. You can use several words, possibly as many as 16, although that many words is typically not necessary. For example, in the image above, the alt text is “Spring portrait of two sisters laughing“. If you use WordPress, alt text can easily be added from the Media Library when uploading/inserting an image. It can also be added after the fact if you hover over the image and select the Edit icon (it looks like a pencil). If you use Squarespace, it’s a little more confusing, but there is a Squarespace guide for adding alt text that you may find helpful. Another way to add text to your image content is to use the image title tag (attribute). This is the text that appears in your browser when you hover over an image. While it might be indexed by Google, experts do not believe it plays an important role in SEO. It’s not necessary to add for every image, but good title text can enhance the user experience when browsing your site, so consider adding it where appropriate. It can be especially helpful when the image is hyperlinked as a call to action or to tell your site visitors what will happen if they click on the image. For example, you’ll see it says, “Contact me to book a photo session with Kelley K Photography!” when you hover over the image above. This image links to my Contact page where potential clients can send me a message. Note that when adding an image in the WordPress Media Library, there is no field to add the Title attribute. Although the first field is labeled Title, that is simply the title that WordPress will use for the image in the Media Library. By default, it is populated with the image file name. The WordPress title is only for your use, and will not appear to search engines or web site visitors. This Title field is not the Image Title attribute. To add a Title Attribute in WordPress, you must click the Edit (pencil) icon after adding the image to your web page, and then add the Image Title Attribute in the appropriate field under Advanced Options. Another important consideration when adding images to your site is that the image is surrounded by relevant content. You want your images to fit with the rest of your page, and be surrounded by words that pertain to the image. Some people choose to add captions directly below the image, others use relevant text in body text before/after the image. If you use WordPress, you can easily add an image caption when uploading/inserting an image using the Media Library. I don’t always love the look of captions, but they are a great way to add specific information about an image that is visible to web site visitors, and closely tied with the image itself (not buried in the text nearby). I may start using them more to add further textual clues about my images, both to improve the user experience and for the SEO benefits. The final consideration when adding images to your web site is to ensure the images are sized appropriately so that they do not slow down your web site’s load times. Slow web sites are frustrating for web site visitors, and Google and other search engines may take load time into account in search result rankings. Additionally, if your site is too slow, users will leave quickly after clicking on your site in search results, and that will definitely hurt your search engine ranking. I recommend keeping images under 400-500 KB. Sizing images for the web is a complicated topic, but my quick recommendation is to first resize your image to the exact pixel dimensions you want to display. That is, don’t upload a 4000 pixel wide image to your web site if you are only displaying the image at 1000 pixels wide. Second, use JPG compression to reduce the file size of images that you post online. You can control the amount of JPG compression using the quality setting when exporting from Lightroom or saving from Photoshop. The lower the quality setting, the smaller the file size, but if you go too low, you will see visible quality degradation in the image. As a general rule, recommend using a quality setting of 80 in Lightroom, or 10 in Photoshop to get a significant reduction in file size without any visual difference in the final image. Thanks for reading the second part of my SEO series. Hopefully it has given you some direction to help improve your SEO strategy. If you have any questions, leave a comment below. If you’d like more help with search engine optimization for your web site, I offer in-person and online mentoring as well as web site design services.